Preparedness is key to recovering from any disaster, natural or man-made. If a major disaster strikes our community, teamwork and training are essential. That’s why the city of Las Vegas Office of Emergency Management and the Federal Emergency Management Agency (FEMA) Emergency Management Institute (EMI) trained city of Las Vegas staff and community partners this month on emergency preparedness, response and recovery. 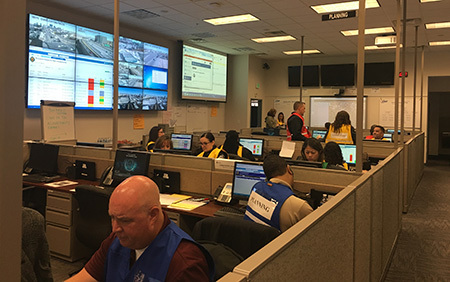 The city of Las Vegas hosted FEMA’s Integrated Emergency Management Course (IEMC) March 11th through March 14th at the Springs Preserve and the city of Las Vegas Emergency Operations Center (EOC). The course covered a wide variety of topics, including: situational awareness, resource management, the role of emergency management, recovery planning and public information. The course concluded with a day-long, functional exercise at the Emergency Operations Center that enabled participants to practice what they learned. FEMA has long provided the course at its EMI headquarters in Emmitsburg, Maryland. City representatives, including Las Vegas Mayor Carolyn Goodman, last attended the course there in 2011. This is the first time it was held in Las Vegas. Some of the other organizations that participated included: the Las Vegas Metropolitan Police Department, the Las Vegas Valley Water District, the American Red Cross of Southern Nevada, NV Energy, Clark County, the City of Henderson, the City of North Las Vegas and Boyd Gaming.